Yesterday we wrote about photo sharing and editing apps. But what happened to tangible, real, live photos? Something you can put in a scrapbook or tape to a wall? Well, with high hopes of reviving the photograph, Polaroid opened its first, of hopefully many, Fotobar in Florida on Friday. In short, the stores aim to help people by offering printing services that will "liberate photos" from phones, cameras, or photo sharing apps. You can print on a wide variety of mediums including canvas, metal, and bamboo, to name a few. Customers can pay $6 to convert six of their digital images into Polaroid look-alike photos, but the prices only go up from there. 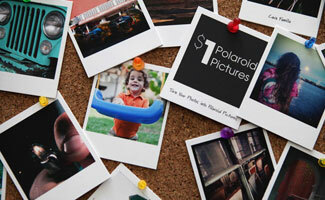 In addition to traditional Polaroid prints, customers can purchase cameras, film, and photo materials. There's also a space at the store where they'll host classes and parties. "The Studio" will also serve as a professional portrait studio. Polaroid CEO Warren Struhl hopes to open at least 10 more Fotobars across the U.S. this year. New York, Boston, Las Vegas, and others are on the short list. With the travel experience moving more online (like everything else), this is an old-fashioned breath of fresh air. Who doesn't want to blow that amazing photo from their last beach vacation up and hang it on their wall? It's much more rewarding to look at there than on a tiny four-inch screen. While I can't imagine doing this for all my photos, I would like to start my own travel collage at my desk or in my apartment. What about you? Are you glad Polaroid is trying to "reintroduce the tangible photograph?"